In his invaluable movie history Easy Riders, Raging Bulls, author Peter Biskind examined the making of 1969’s EASY RIDER, an iconographic picture whose box-office success made it the surprise of 1969, and a milestone that wound up defining the whole decade. Biskind could not conclude who - if anybody – actually directed it. Dennis Hopper got onscreen credit. Volatile co-star Peter Fonda certainly shaped it. And the co-screenwriter, satirical writer-journalist Terry Southern, was definitely involved. Other sources say editor Donn Cambern scissored down Hopper’s original four-hour cut, and that Henry Jaglom assisted. But the whole film shoot (on a project that Roger Corman rejected, so it bounced to Columbia Pictures) was a haphazard, drug-disoriented affair, and the film shoot happened concurrent with the national trauma of the RFK assassination. 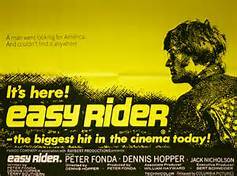 Ultimately, Biskind writes, it's impossible to say who made EASY RIDER. It just kind of...happened. Or God directed it. The loosely plotted material was not in itself groundbreaking. There had been bikesploitation movies before (quite a few with Fonda and Jack Nicholson), and Hollywood scrutinies of the drug scene. And yet it came together here in a mostly on-target modern tragedy that finds two rebel motorcyclists, Billy (Hopper) and Wyatt (Fonda), flush with cash after a drug deal at a Los Angeles airport, motoring cross-country to New Orleans for Mardi Gras. But the footloose pair find no comfort, either at bravely faltering hippie communes, or in viciously hostile small towns, or in their drug-tripping attempt to have a good time in the Big Easy. Minor-league actor Jack Nicholson shot to permanent stardom with his supporting role as George Hanson, a boozy ACLU lawyer who helps get the bikers out of a jam with southern rural cops, who throw the long-haired strangers in jail for “parading without a permit.” Hanson claims to know what Americans fear the most: freedom, a notion that hits home today especially. In the famous ending, disillusionment and foreboding the two cyclists feel as they traverse an unfriendly USA crystallize in a climax of blunt, senseless violence. While other movies of the era still celebrated hippie love and good vibes as if Austin Powers actually got it right, EASY RIDER seemed to predict the fading of Woodstock optimism, even before the Manson Family and Altamont made the headlines. Critic Irv Slifkin wrote that the secret of EASY RIDER was that it was youth-oriented material that actually had, in fact, been made at eye-level by a breed of the fairly footloose, motorcycle riding, drug-sampling young people it depicted – not coordinated professionally by aloof, starchy, conservative studio guys or all-business types like Corman. The movie, budgeted at less than half a million, wound up generating $20 million in the domestic box office alone. And, in art-imitates-life, counterculture talents Hopper and Fonda were among those suing each other over the proceeds, which only goes to show that somebody sure knew what they were doing here. And there is the legend that in the aftermath of EASY RIDER's box-office smash, Hollywood showered cameras and cash upon just about every dazed counterculture longhair who wandered in the door, the executives vainly hoping to catch that lightning in a bottle again. And there are still vaults holding tons of unreleaseable celluloid that resulted.